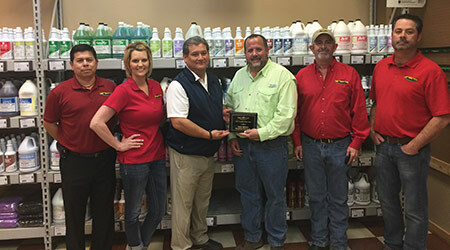 Spartan Chemical Company, a leader in the formulation and manufacture of sustainable cleaning and sanitation solutions for the industrial and institutional market, announced that Jessy Brown, regional manager, Spartan Chemical Company was named West Texas Fire & Industrial Supply 2016 Vendor Representative of the Year. Each year, West Texas Fire & Industrial Supply recognizes one vendor representative that provides superior customer service and exemplifies honesty, integrity and responsibility. This year, Jessy Brown was selected to receive the Vendor Representative of the Year award. The award was presented to Jessy Brown by Kendall Hirschfeld, vice president, West Texas Fire & Industrial Supply during West Texas Fire & Industrial Supply’s customer appreciate golf outing on April 1, 2017.